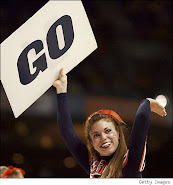 All photos by Streeer Lecka/Getty Images. 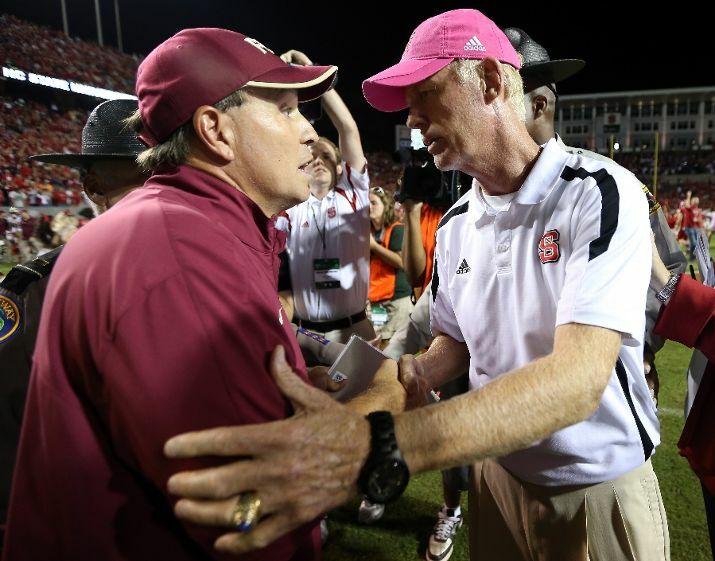 Head coach Jimbo Fisher of the Florida State Seminoles shakes hands with head coach Tom O'Brien of the North Carolina State Wolfpack. 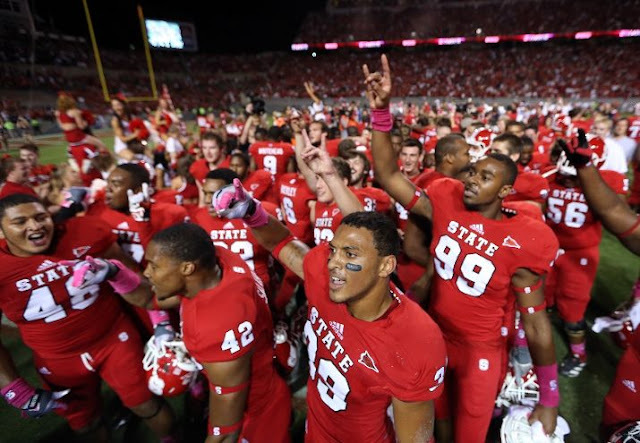 The North Carolina State Wolfpack run onto the field against the Florida State Seminoles before their game at Carter-Finley Stadium on October 6, 2012 in Raleigh, North Carolina. 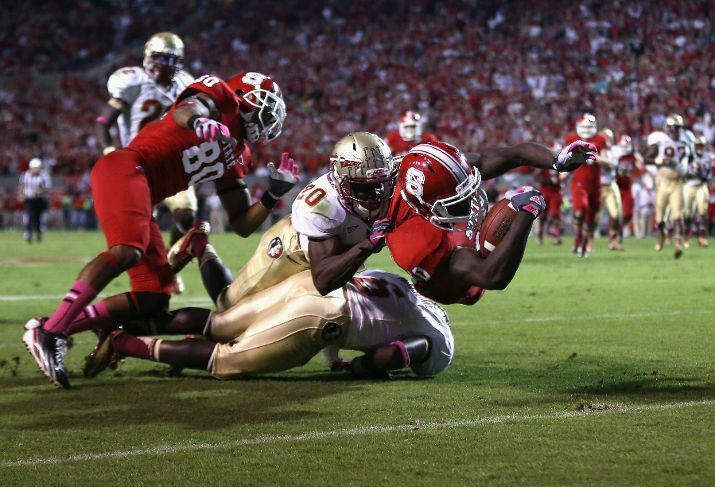 Shadrach Thornton #10 of the North Carolina State Wolfpack dives for a touchdown as Lamarcus Joyner #20 of the Florida State Seminoles try to make a stop. 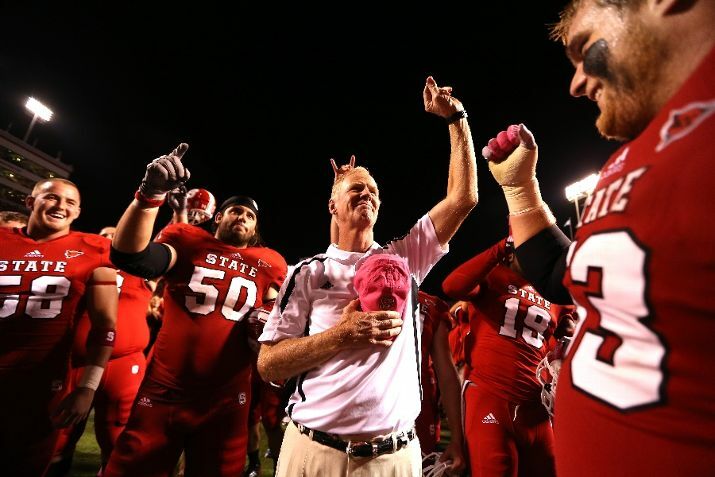 Head coach Tom O'Brien of the North Carolina State Wolfpack celebrates after defeating the Florida State Seminoles 17-16 at Carter-Finley Stadium. 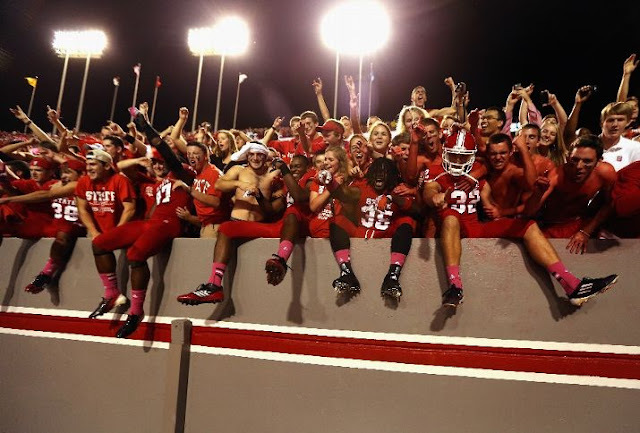 The North Carolina State Wolfpack fans celebrate with players in the stands after defeating the Florida State Seminoles 17-16 at Carter-Finley Stadium. 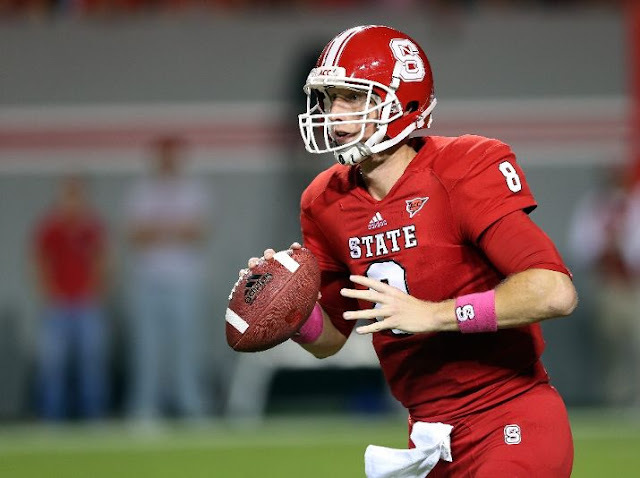 Mike Glennon #8 of the North Carolina State Wolfpack drops back to pass. Teammates Terrence Brooks #31 of the Florida State Seminoles and Christian Jones #7 collide with Mario Carter #87. 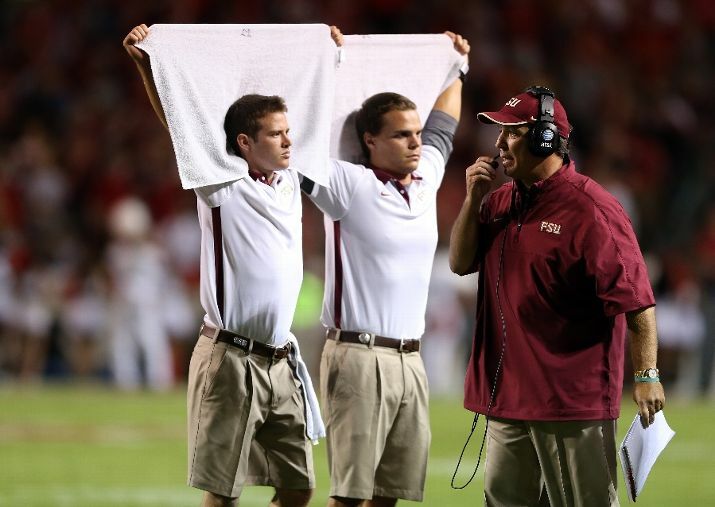 Head coach Jimbo Fisher of the Florida State Seminoles calls a play from the sideline. 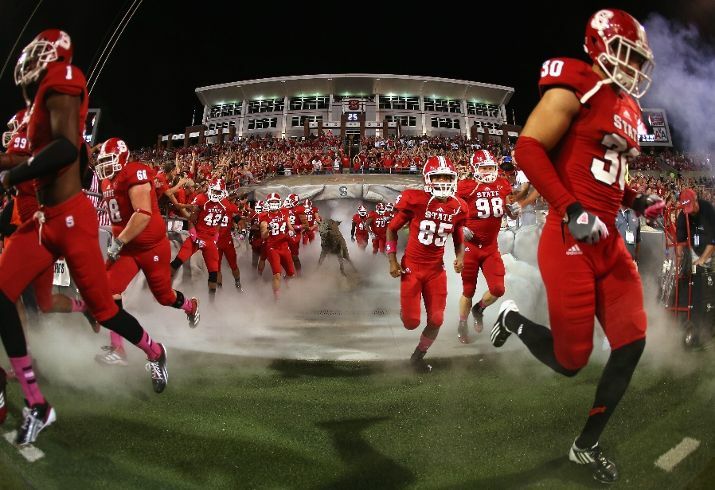 Sterling Lucas #7 of the North Carolina State Wolfpack stops Chris Thompson. Darryl Cato-Bishop #92 of the North Carolina State Wolfpack goes after EJ Manuel #3 of the Florida State Seminoles. Nick Waisome #6 of the Florida State Seminoles knocks the ball away from Rashard Smith #2 of the North Carolina State Wolfpack during their game at Carter-Finley Stadium. P.J. Williams #26 of the Florida State Seminoles dives for Tobais Palmer #4 of the North Carolina State Wolfpack. The North Carolina State Wolfpack celebrates after defeating the Florida State Seminoles 17-16.